A couple of months ago I was contacted by Judith Weltman of DaLori Designs, LLC., concerning photography of her bracelet designs. As a photographer who enjoys working with jewelry, I was of course, intrigued. 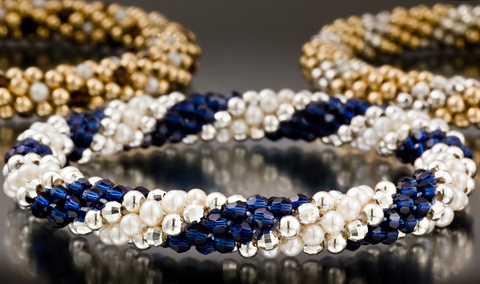 The Dalori Designs bracelets are uniquely beautiful, made from the highest quality materials, such as Swarovski gemstones, gold or silver beads and freshwater pearls in colorful arrangements. Many are geared towards college and university color schemes in what DaLori calls “The Team Spirit Collection”. This is in addition to “The Classic Collection”, with it’s more understated elements and colors. By the way, since I am a Penn Stater and former player for the great Joe Paterno, it was doubly enjoyable to learn that Ms. Weltman is not only an enthusiastic PSU supporter (her husband’s alma mater) but is also great friends with the Paterno family. We’ve had some wonderful talks over the intervening months concerning our love for the University and my former coach. We ARE Penn State! Jewelry, food photography and business executive head shots or portraits are my specialties.